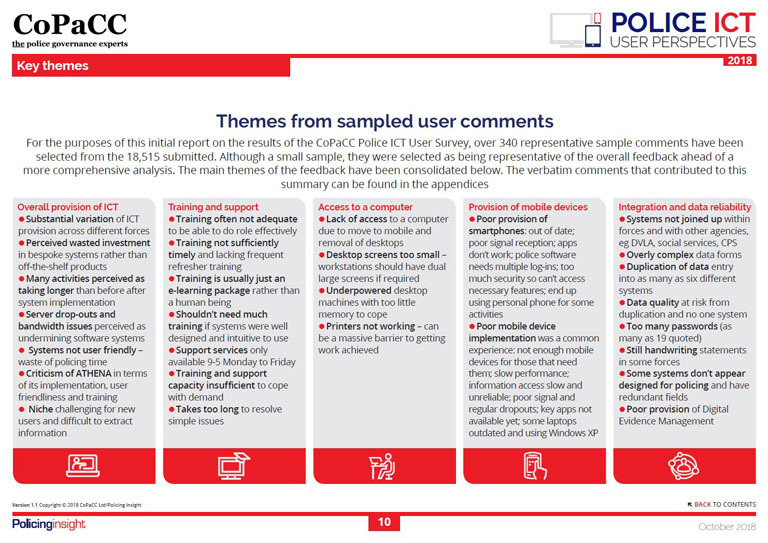 The results of this year's Police ICT User survey have now been published, with police officers and staff expressing deep dissatisfaction with ICT provision in their forces. They tell a story of badly specified, out-of-date equipment, slow and unreliable systems with poor integration combined with a lack of suitable training and support. 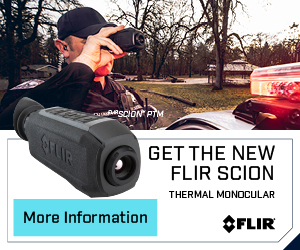 Effective ICT is critical to facilitating positive policing outcomes, particularly when resources are stretched and crime continues to diversify. Despite ongoing budgetry pressures, increasing demand means ‘do nothing’ is not an option and forces must implement efficient and effective ICT systems and processes if they are to counter the threat and give themselves an advantage. 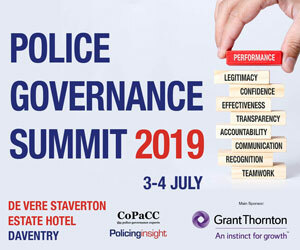 There is no doubt that the police leadership and the supplier community recognise that there is much to be done in police ICT, but it is important that their direction of travel and decisions are smoothed and shaped by the voices of the frontline users. 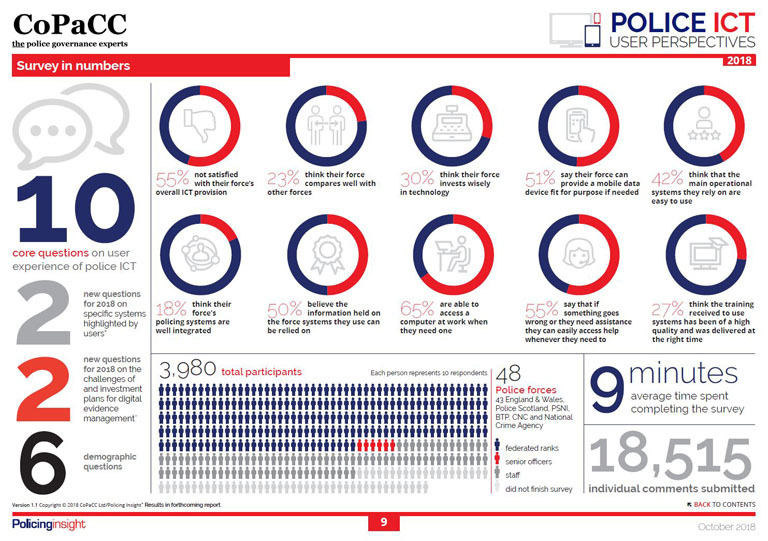 The 2018 CoPaCC National Police ICT Survey provides a unique insight into the frontline views and experience of police ICT users. The pilot survey was launched in 2017 and surveyed the views of police officers in England and Wales and Scotland with close cooperation from the Police Federation of England & Wales, the Police Superintendents’ Association and the Association of Scottish Police Superintendents who promoted participation to their members. This year’s survey, once again with support of the Federation and the two Superintendents’ Associations, is broader in scope, inviting officers and staff of all ranks and roles from 48 UK police forces to take part, providing a valuable and comprehensive view of the provision of police ICT across the UK. The response was tremendous with nearly 4000 participants answering 10 core questions (4 further questions about specific systems and Digital Evidence Management will be covered in future reports) about their experiences of police ICT in their force including the submission of 18,515 individual comments telling the story of their daily experiences of working with ICT in their role. These first-person accounts are truly fascinating and support the case for more consultation with end users about their requirements when designing, procuring and implementing new police systems. As well as asking about police users’ overall satisfaction, the survey questions covered various aspects of ICT provision including investment, access to a computer, mobile device provision, system integration and reliability and training and support. The results show widespread dissatisfaction with 55% of participants dissatisfied with their force’s overall ICT provision. Only 30% of officers and staff believe that their force invests wisely in technology with comments highlighting huge amounts money and resource spent on developing systems not fit for purpose. Many officers and staff commented that police forces were not getting even the basics right such as access to a computer (65% said they were able to when needed), having printers available and working and WiFi or phone signal availability. Even when a computer was available many do not have the power, memory or access to sufficient data bandwidth to carry out the tasks required effectively. An area of real concern is that only 18% think that their policing systems are well integrated. This means time is wasted entering the same data several times into different systems. This raises the risk of inconsistent or even incorrect data being held and could have serious implications for investigations and building a criminal case. The extra checks to mitigate these risks can only waste further valuable police time. The fact that only 50% of officers and staff believe that the information held on their force systems can be relied upon only reinforces the concerns. Training and support is also a big issue for police users with only 27% of officers and staff feeling that the training they have received to use systems was of a high quality and delivered at the right time. The biggest criticism of the police ICT support for users encountering issues was that the help desks provide mostly a Monday to Friday, 9-5 service unless for exceptional circumstances – this is generally fine for office-based users but for officers out on patrol, not being able to resolve even a minor issue could impact on their ability to fulfil their role effectively and efficiently. The strong feeling of users was that a 24/7/365 police service needs 24/7/365 support. 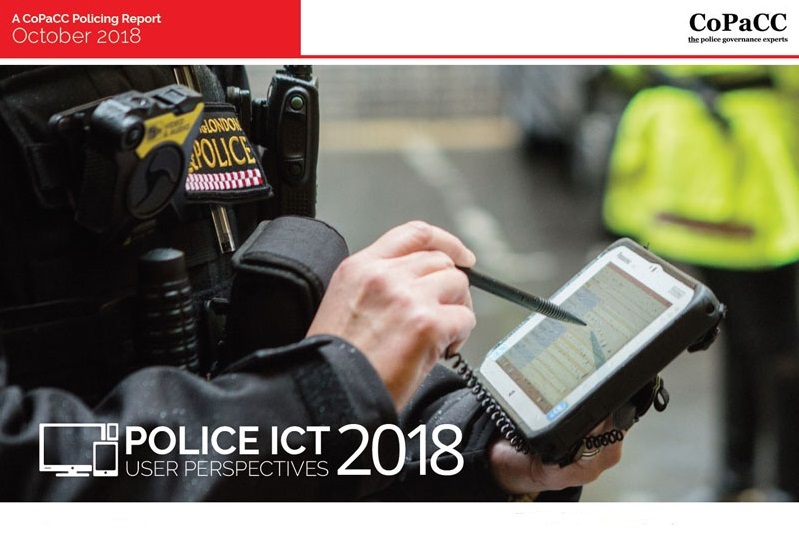 The CoPaCC Police ICT: User Perspectives Report 2018 provides a valuable evidence base for those making the decisions to improve police ICT. There will be few surprises for those involved in police ICT but having the views and experiences of officers and staff documented and updated annually can only help to inform and track improvements in police ICT provision – improvements that will help police forces face the challenges of the future. Free access to a brief summary of some headline results and themes from the survey can be found below. 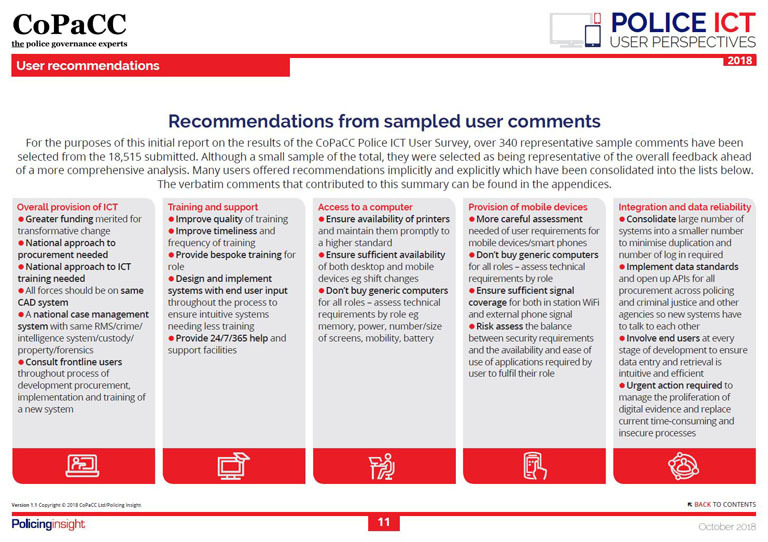 The detailed results are published in the CoPaCC Police ICT: User Perspectives Report 2018 available to Policing Insight subscribers. The full 90-page report has in-depth comment and analysis as well as verbatim comments from officers and staff. Subscribers can download the report here. Most police forces and key police and criminal justice organisations, as well as many academic and commercial organisations in the sector, have organisation wide subscriptions providing free access to their officers and staff. Please register an account on Policing Insight using your organisation email address – if your organisation has a subscription, your account will be automatically upgraded to Subscriber access allowing you to download the report. If your organisation does not have a subscription, please contact [email protected] to enquire about gaining access to the report. Alternatively, you may already have subscriber access via your organisation – just register/log in using a valid email address from your organisation and you will be automatically upgraded if there is a subscription in place. Most UK police forces/OPCCs already have an organisation wide subscription so many police officers and staff already enjoy free access. You might also already have free access if you are an academic studying/researching in policing and criminology, with most relevant UK institutions in this sector having organisation wide subscriptions in place.